A lot of photographers always ask me if I get the same buzz from seeing my images published now as I did when I first started. The simple answer is YES!!! I remember the first time I had a cover of a magazine was for the Field, selected by it's lovely picture editor Rebecca Hawtrey. Unfortunately I don't have a scan to show you but it was a rather striking white and blue cover with a small mountain hare. The image is in my print gallery, just click here if you wanna take a look. Anyway I was so excited that I hung around out WH Smiths and anyone who picked the magazine up I went up and said it was mine! I know, the stupidity of youth and it makes me cringe now, but I was so excited and I even got a hot date out of it (date being in the singular). The point is as a professional wildlife photographer I can go off on some tangent producing work that is acceptable to the art community but which would never keep the mortgage paid. I'm being honest here, any professional who says it's just about the art is kidding themselves out of business. So getting images in the press is both satisfying financially, plus a reward for all the hours and bloody hours it takes to get the image. No wildlife shot is easy, these days the hardest part is getting away from everyone else!! Anyway I have had the cover of most well known wildlife and lifestyle magazines at some time, but UK stalwart Country Life has always eluded me. 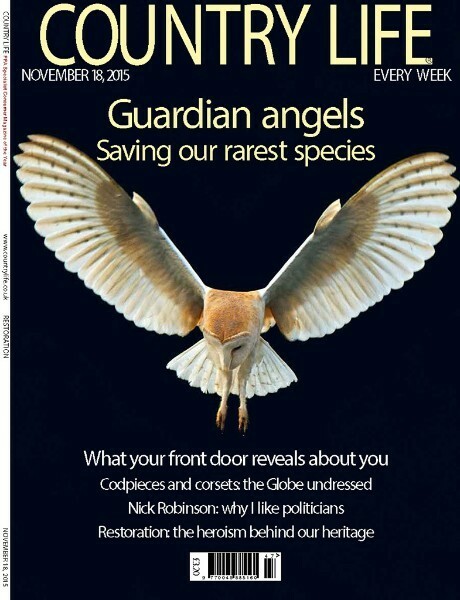 Well no longer, here you go with last month's cover of a beautiful wild barn owl hovering against a darkened forest. Taken with Squadron Leader Russell and Eddie the Onion for company, it was a real team effort and such a nice reward for the hard work. Thanks Country Life!